"Putney Society says NO to the Thames Tunnel"
The STOPtheSHAFT residents group who are working to save Barn Elms from Thames Water's plans for the Thames Tunnel staged a protest march on Saturday 11th December. Local residents objecting to Thames Water's plans to use Barn Elms as a main shaft construction site, turned out in force to show their opposition. The march was also attended and supported by Councillor Jim Maddan. Locals gathered at 10am in leaders gardens and walked peacefully for one hour along the towpath of the affected area with banners and balloons. 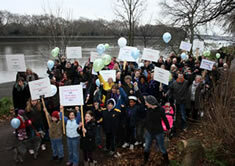 They then marched along the length of Putney Embankment spreading the message of "Brownfield not Greenfield". Members of the sea scouts, local schools and many residents of Horne Way affected by the Barn Elms plans were also there to protest about potentially losing their facilities to the project. A spokesman for the group said "We are really pleased to see so many people and Cllr Maddan attending this protest. This march will raise more awareness of this issue and highlight the unnecessary use of greenfield sites, the loss of essential local facilities, and potential impact to our rowing and sailing community, all of which are needless when there are suitable alternative sites and strategies for the project." People can also sign the STOPtheSHAFT petition online at www.gopetition.com/petition/40513.html.